You may (or may not) remember this project I was working on a few months ago. These pretty Kona solids were for an new quilt project that is part of a Craftsy workshop that came out this month. After keeping this quilt under wraps for many months, I’m excited that I can finally reveal the full quilt. This new pattern is called Hopscotch. The pattern and kit for the quilt top are currently available as a Workshop on Craftsy. 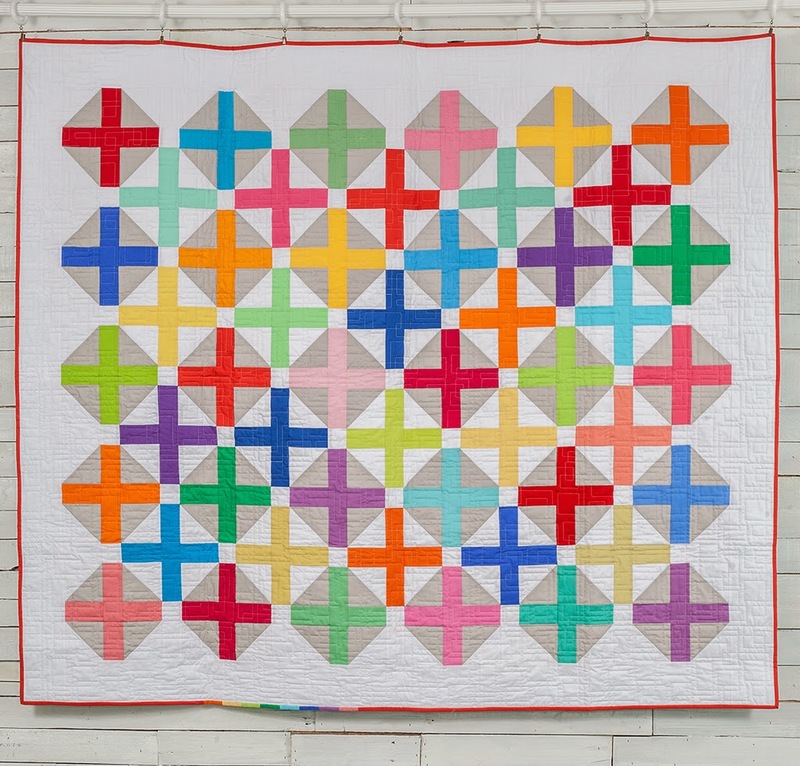 This workshop is different than a Craftsy video class, but is a step by step pattern with access to forums for asking questions and recieving feedback as you create your own quilt using the fabric in the kit. The cost includes not only the instruction, but the fabric for the quilt as well. The first round of kits for this workshop sold out but they are now available again for a limited time at a discount. It’s so fun to finally be able to share the finished quilt! The quilting on this quilt was done by Melissa Kelley. 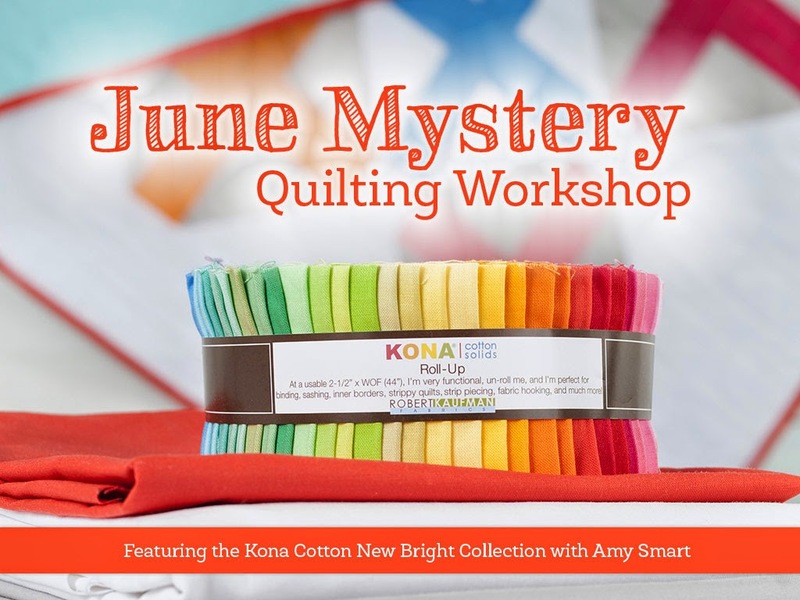 To find out more about the class and kit, visit Craftsy. I’m working on baby version using some of my remnants and this time putting the colors in spectrum order – there are so many variations with these Kona solids. I can’t wait to see what other people do. Your quilt looks lovely. I hope the comment settings work out for you. Love that bit of rainbow in the binding &amp; the quilting. What a beautiful quilt, Amy! I&#39;m always a sucker for solids 🙂 The Craftsy workshop format is such a cool idea! I missed out on it in May, but not this time! Just ordered the workshop and can&#39;t wait to get it!! I just love the colors in that new Kona collection. So bright!! You know how much I just love Kona solids. My very favorites! Is this available as pattern only? I love that pattern Amy! It&#39;s so cute. Good job! Love, love, love those Konas! And the quilting on Hopscotch is awesome! 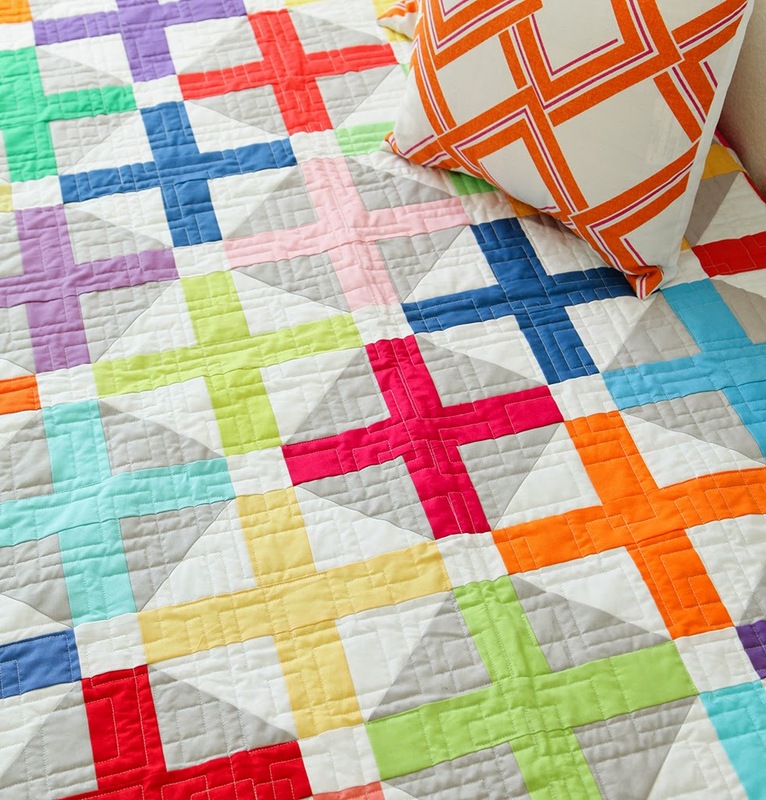 love the pattern of the quilting lines! Love the bright colors and how you arranged them all. Love the little extra multi color binding added just in the one spot. Looking forward to seeing the baby size quilt and pattern. Just ordered the kit and workshop. Any idea how the workshop can be accessed on the Craftsy site? It says it was available on June 1, but I can&#39;t seem to find the link anywhere. Thanks. So excited! I think I&#39;ll try spectrum order as well. Whoops …. &#39;Fabulously fast quilts&#39;. It&#39;s an orange link on the left side of your My Craftsy page. The link is titled My Workshops.<br /><br />Great pattern. I bought the kit sight unseen. Looking foward to it.